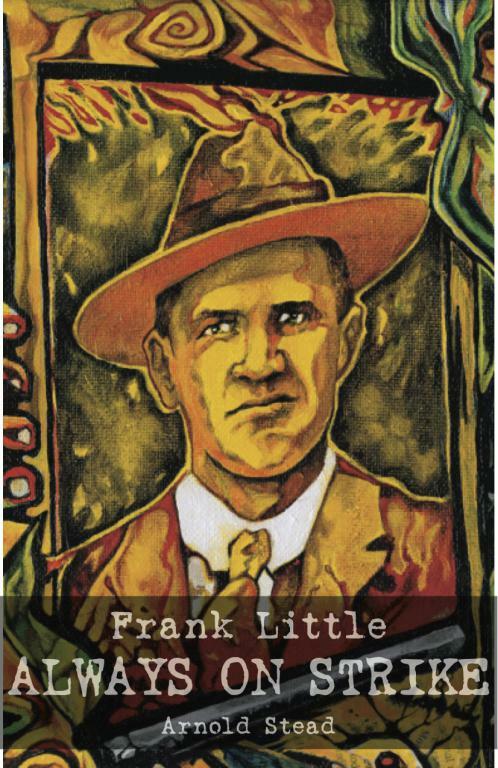 A review by Juan Conatz of Always on Strike: Frank Little and the Western Wobblies. Stead, Arnold. Always on Strike: Frank Little and the Western Wobblies. Chicago: Haymarket Books, 2014. Paperback, 220 pages, $16. Among the list of legendary figures of the historical Industrial Workers of the World (IWW), Frank Little stands out as one of its most tragic figures. Although known more than some others, such as Vincent St. John, Matilda Rabinowitz or Frank Cedervall, he didn’t leave behind a cultural legacy like fellow martyr Joe Hill. Nor did he live long enough to write a memoir, like Ralph Chaplin. We remember Little mostly as a victim; a victim of wartime hysteria and anti-union violence. Secondarily, we might remember him for being biracial, the son of a white Quaker husband and Cherokee wife. But his activities as a member and organizer for the IWW are mostly little known. “Always on Strike: Frank Little and the Western Wobblies” by Arnold Stead aims to change this. Published by the International Socialist Organization-affiliated Haymarket Books, it is the only book-length work on Frank Little. Although relatively short, it does offer some information that is hard to find elsewhere. Overall a sympathetic account of both Little and the Wobblies, much of the book covers territory previously incorporated in other histories of the IWW. The IWW’s efforts in the Western United States, its mixed opposition to World War I, and the repression it faced during the first Red Scare, are all given ample room. The author also concerns himself with refuting certain myths about the IWW. Whether from hostile historians, foaming- at-the-mouth-press, or friendly, if condescending, writers, Stead defends the union, its Western sections in particular, from a number of slurs, assumptions of motivation and unhelpful categorizations. In 1913, Frank Little led an ore dockworkers strike that has been all but ignored by history. Even historians of the IWW like Philip S. Foner, Joseph R. Conlin, and Patrick Renshaw make no mention of the 1913 conflict; nor does Big Bill Haywood’s autobiography. Melvyn Dubofsky briefly mentions Little being kidnapped and rescued but does not deal with the strike’s contribution to a major labor offensive in the northern Minnesota, Wisconsin, and Michigan mining area. There are also some useful accounts of the Agricultural Workers Organization (AWO). The AWO was a hugely important part of the IWW around that period and was arguably its most successful attempt at sustainable organizing. It changed the way the union used delegates and took in dues. It apparently abandoned the prevailing pacifism in the organization in favor of militant self-defense, and brought conflict in the union over what “industrial unionism” meant, or if it was actually important at all. Despite this, there are currently no book-length treatments of the AWO. Most histories that partially focus on the AWO are brief and a bit superficial, so the author’s inclusion of it as a topic is valuable. Little was vehemently anti-war, and the descriptions of the IWW’s wrangling over whether to oppose and how to oppose World War I are interesting. There are a number of authors, even ones friendly to the IWW like Staughton Lynd and Eric Chester, who have claimed that the IWW did not oppose World War I. This is not true. It passed resolutions against the war and published material that was anti-war and anti-nationalist in nature. The IWW did formally oppose World War I, but never came to an agreement on what it meant to oppose it. There were mixed opinions on this, ranging from “do nothing, wait for the storm to blow over” to “actively oppose and disrupt conscription.” There were Wobblies that participated in antiwar or anti-conscription coalitions and other bodies that encouraged buying war bonds and enlisting. Despite rejecting some common myths about the IWW, “Always on Strike” nevertheless accepts other myths itself. For example, making the same mistake as many other historians who focus on syndicalism or the IWW, the author matter-of-factly relates the vision and outlook of the early IWW back to French intellectual George Sorel. In reality, there is little evidence that Sorel had even a negligible influence. To the extent that French syndicalism had an influence, people like Confédération générale du travail (CGT) militant Emilie Pouget had a far greater impact. Pouget’s writings were translated, published and distributed in the IWW. He is mentioned dozens of times in the Industrial Worker. Sorel, on the other hand, receives only a passing mention in the same series in the Industrial Worker about French syndicalism. None of his writings seemed to have been translated, published or distributed in the union. As far as I could find, only one article focused on his ideas ever appeared in the IWW press, and not until 1919, a full decade after this influence was supposed to have occurred on the formative IWW. Concepts such as the revolutionary general strike and the “militant minority,” which some historians and writers claim the IWW adopted from Sorel, already existed as concepts and terms within French syndicalism years prior to Sorel writing about them. Furthermore, these terms were used by syndicalists that Wobblies would have been far more familiar with than Sorel. Why is this important? Well, Sorel’s writings on violence and myth making, his move to the nationalist Right and his influence on fascism have been used in the past to tar syndicalism or revolutionary unionism by association. Other authors have demonstrated how Sorel’s supposed influence on syndicalism was an exaggeration made by early, lazy historians and then repeated over time. Apparently, such is the case with Sorel and the IWW, as well. Another shortcoming of “Always on Strike” is that there are large parts of the book where the author assumes Little is at an event, such as a strike or a free speech fight. Sometimes the evidence provided for these assumptions is convincing. Other times it is not. The author also, occasionally, “imagines” what Little would say about a situation or event. Maybe Stead felt this was necessary because there is very little information on Little’s activities. While this reason is understandable, it should have been avoided. It is one thing putting words in someone’s mouth based on you knowing and collaborating with them, such as Friedrich Engels finishing the works of Karl Marx. It is another thing altogether when, 100 years after a person’s death, a historian does this in a biography. While well intentioned, it would have been preferable to stick to the evidence, even if that meant shortening the book to pamphlet-length. For an author rightly concerned about inaccurate historical myths, he very well could be creating them by these assumptions and imagined statements. Lastly, it would be a disservice to readers of the Industrial Worker not to mention the background of the author, Arnold Stead. During the early 1970s in Kansas City, around the time Students For A Democratic Society met its demise and the Weather Underground was established, Stead and some others were arrested and charged in a bomb making case. Stead cooperated with authorities. Although he now claims he was tricked and later went back on his testimony, people spent hard time in prison because of his cooperation. Whatever we may feel about the “urban guerrilla” groups of the 1970s, it is simply reprehensible to cooperate with authorities and send fellow radicals off to the dungeons of the state. While the book is appreciated, our martyrs deserve better historians, better admirers, and better people than Arnold Stead to keep their story alive. The IWW at one hundred: the return of the haunted hall? My favorite agit-prop films of all time is Travis Wilkerson's An Injury to One, about the murder of Frank Little. Amazing piece of work, worth checking out if you've not seen it. While I appreciate the following at the end of your review, "Lastly, it would be a disservice to readers of the Industrial Worker not to mention the background of the author, Arnold Stead. During the early 1970s in Kansas City, around the time Students For A Democratic Society met its demise and the Weather Underground was established, Stead and some others were arrested and charged in a bomb making case. Stead cooperated with authorities. Although he now claims he was tricked and later went back on his testimony, people spent hard time in prison because of his cooperation. Whatever we may feel about the “urban guerrilla” groups of the 1970s, it is simply reprehensible to cooperate with authorities and send fellow radicals off to the dungeons of the state. While the book is appreciated, our martyrs deserve better historians, better admirers, and better people than Arnold Stead to keep their story alive." I have to respond. 1) Stead was not tricked into anything. Even if he did not understand the deal he was making, which he did (he explained it to me when I visited him in the Jackson County, Missouri jail in the summer of 1970), it was re-explained to him numerous time by others. He knew what he was doing. 2) As I told you before Stead never changed or renounced his testimony. He did stop testifying for a bit while he worked out another deal to cover him in state court cases in Kansas (which he learned existed when I and others were actually charged with state charges in addition to federal charges). He had simply never given thought to the fact that in addition to protection from federal charges, he might need protection also from state charges. As soon as he made the deal with the state folks, he resumed testifying in several state trials (including two of mine), and in the federal trial against all of us. Finally, you must ask yourself, and only you can answer, if you have put money in the pocket of this guy and legitimized his work and himself simply by reviewing his book. Again, I do appreciate your final words (though I think they belong at the beginning). I just hope people read that far. Guardian article about Frank Little, cites this book and mentions one to be published by his niece.